Cloth Material: Satin, lace, cotton, silk, leather and Chameleon. Dolls not include. 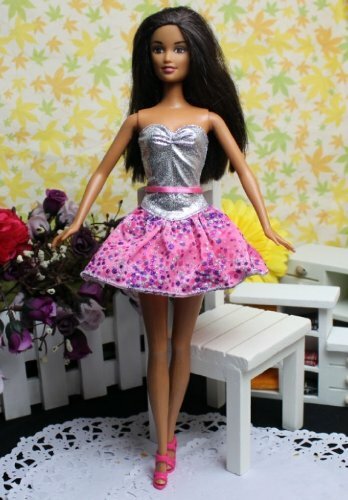 Dress fits: Barbie Doll, Vintage Barbie Doll, Silkstone Barbie Doll, Momoko Doll, Blythe Doll, Pullip Doll, Jenny Doll, Fashion Royalty etc. 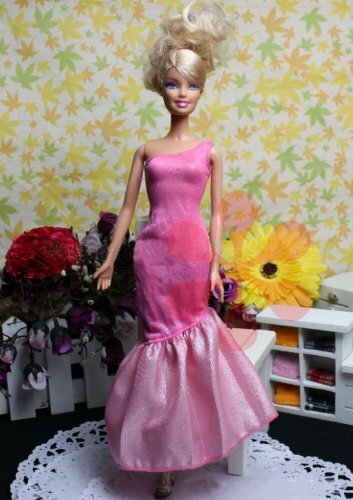 We have over 30 different barbie dresses and cloches. Clothes will be randomly chosen from our inventory, they are all pretty, all brand new! Shining glitter bling powder coated on Barbie clothes may come off slightly(in tiny little flakes), especially before the first wash. It is expected behavior due to the nature of glitter bling powder but does NOT affect use. Package: Height: 0.4" Length: 2.8" Width: 2.4"